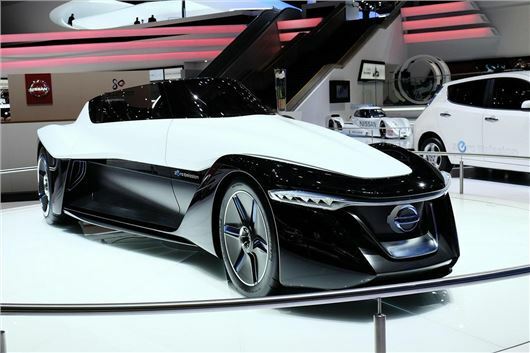 The Nissan BladeGlider enjoyed its European debut at the Geneva Motor Show. The electric sports car has been inspired by Nissan's quirky Deltawing Le Mans car and rumours persist that it could even make it into production, within just three years. The BladeGlider features a narrow front track that helps to create the unusual swept-wing look when viewed from above along with a wraparound windscreen that flows into the side windows. The concept has no roof but does come with three seats. The driver sits in the middle with space for two rear passengers behind. Powered solely by electricity, the BladeGlider has the lithium ion batteries and electric motor located between the rear wheels which is designed to give perfect weight distribution and traction. The BladeGlider was officially revealed at the Tokyo Motor Show last November but this will be the first time it has been shown in Europe.